All countries confront the problem of providing for dependent, neglected, and 1 abused children. While the exact form of institutional response will differ in relation to a country's political and economic structure, its culture and its tradition, the same general kinds of child welfare services have been developed 2 everywhere. Literature from the United States, Canada, and several Western European countries reflects a shared concern about children who reside in unplanned, substitute care arrangements and a growing recognition of the importance of 3 making permanent plans for these children. The American response to this problem took shape in the early 1970s when government at the local, state, and 4 federal levels undertook to fund permanency planning projects. Permanency planning projects were charged with developing and testing procedures that would increase the likelihood that children would move out of substitute care arrangements into permanent family homes either through restoration to their biological families, termination of parental rights and subsequent adoption, court appointment of a legal guardian, or planned emancipation for older children. Long-term foster care, if it was a planned outcome supported by the use of written agreements between foster parents and child care agencies, was recognized as an appropriate option for some children. 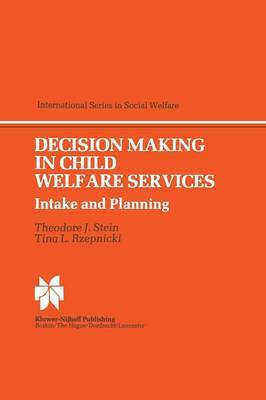 2 DECISION MAKING IN CHILD WELFARE Permanency planning projects have had a direct effect on the substantive aspects of social work practice in child welfare.